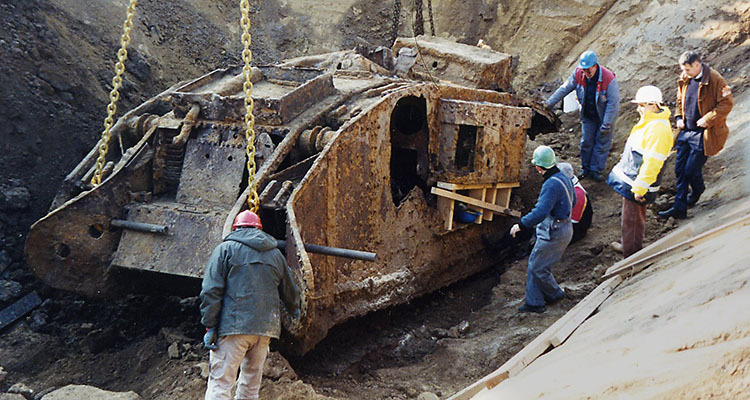 In 1998 Philippe Gorczynski from Cambrai found a Mark IV tank (female) buried beneath a field in the village of Flesquiéres, on the Cambrai battlefield. 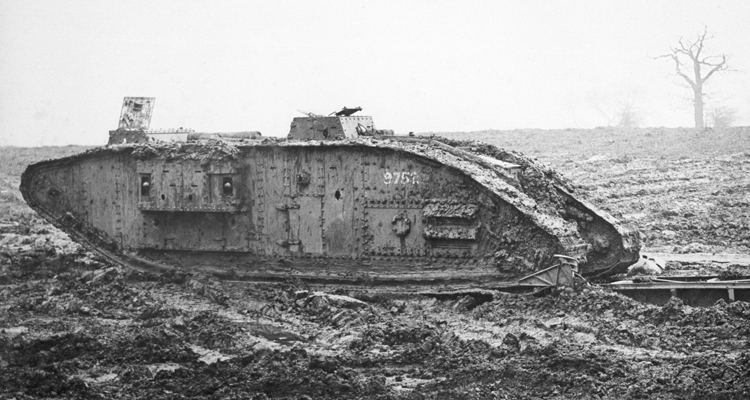 The tank was badly damaged but still recognisably a Mark IV so, at great expense, Philippe had the tank exhumed and placed on display. The question then was, what tank was it? Research narrowed the possibilities down to two, D41 Devil II or D51 Deborah. Second Lieutenant Jones of Devil II was buried in Flesquiéres Cemetery, but Second Lieutenant Heap of Deborah appeared to have survived. Shortly after I returned home from France, after viewing the tank, I was contacted by a friend of mine who was then commanding the ranges at Eskmeals in Cumbria. One of his civilian staff was the grandson of a Tank Corps officer who had been awarded the Military Cross, and if I would send a copy of the medal citation he would reciprocate with a photograph of his grandfather’s tank. Nothing could be easier and the citation was duly sent off, a few days later back came the photograph and comparing it with a shot I had taken of Philippe’s tank it was obvious that the damage was the same; not similar but identical, it had to be the same tank. On the back of the print was written ‘Mr Heap’s bus’, which told us at once that it was D51, Deborah that Philippe had found. 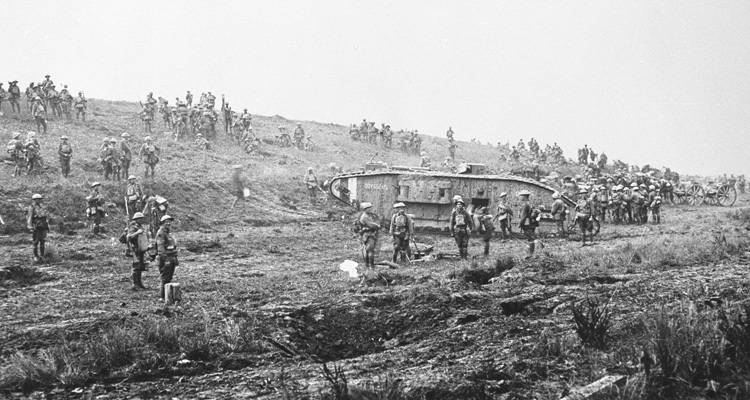 The tank commanded at Cambrai by Second Lieutenant Frank Heap. I sent a copy of the photo off to Philippe in France and it seems to me now that no sooner had I stuck the envelope down than the phone on my desk started ringing, and jumping about all over the place. It was Philippe, very excited, telling me that I had accurately identified the tank as D51 Deborah. Since then we have found a photo of the tank being buried and you can read the number D51 on the fuel tank at the back so now there is no doubt at all. The tank uncovered in Flesquiéres is D51, Deborah. See David Fletcher on the Mark IV in his Tank Chat here. 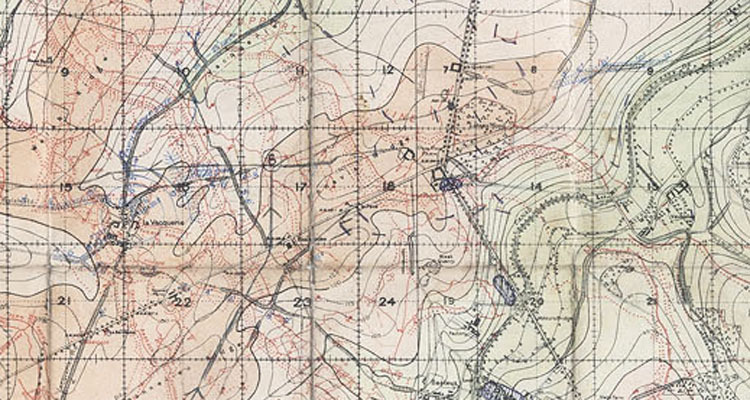 Deborah, a Mark IV Female of 12 Section, 12th Company, D Battalion, was one of a number of vehicles in the second wave of the attack tasked with attacking the Hindenburg Support line west of Flesquieres. Commanded by 2/Lt. Frank Heap, she entered the village, firing into the ruins to suppress the defenders. As she left the shelter of the village she was hit by several enemy artillery rounds and five of her eight crew were killed. Lt. Heap and the two remaining crew members were able to retire back to British lines. He was subsequently awarded the Military Cross for his gallant actions. Deborah then disappeared for over seventy years, but local tradition persisted of “a tank pushed into a hole”, supposedly by Russian POWs under German command. In 1998, after six years research, Philippe Gorcynski located and excavated her and, after a brief sojourn under a tarpaulin, she is currently residing in a barn on the Rue du Moulin, Flesquieres. 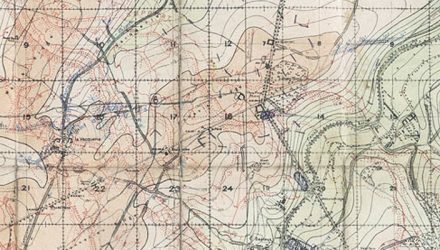 It is more likely that she was in fact buried by a Tank Corps recovery unit in a clear up operation, having first been stripped of anything useful. Deborah herself is now a Monument Historique and it is hoped that a museum will be built to house and conserve her on a patch of land on the edge of the village; resting within a few metres of the graves of her crew in the Flesquieres Hill British Cemetery. 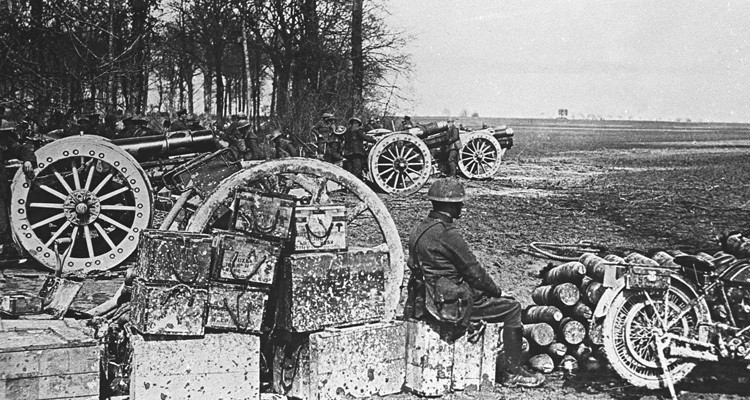 For more information on the Battle of Cambrai, watch The Tank Museum YouTube documentary, Cambrai: The Tank Corps Story.